Sky Sports Premier League is part of the Sky Sports family of channels recently launched and re-branded. This new channel will provide 126 Premier League live matches across Monday nights, Friday nights, Saturdays and Sundays throughout the season. This new channel will offer a new weeknight debate show as well as dedicated club programming including interviews, documentaries, behind-the-scenes access, news and highlights. To supplement the live programming, you can access enhanced live features on the Sky Sports app. The new channel will provide extensive live football every week covering the EFL, Carabao Cup, SPFL and La Liga, as well as Euro 2020 qualifiers. Programming will also include reviews and dedicated match reports and analysis shows as well as expert debate and analysis on EFL and La Liga. 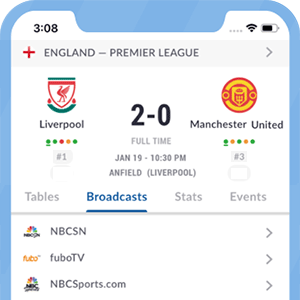 Subscribers can access supplementary programming and features on the Sky Sports app such as live action, goals and highlights. *Got itLive Soccer TV does not provide Sky Sports Premier League live streaming. The information provided on this page is simply Sky Sports Premier League soccer TV schedule.